People working in 2D to stereo 3D conversion industry are often in a deep need of fast and accurate software for depth map generation. YUVsoft has a specially designed tool that allows generating depth maps for a whole video shoot using just one or two previously made key frames. So YUVsoft Depth Propagation plugin for Nuke expands depth frames which you can obtain using other YUVsoft plugins (such as Depth Effects or Depth from Focus for example) through the whole video sequence and it is a perfect solution if you really want to save your time and energy. The General post-processing mode performs accurate smoothing by adjusting the depth on the object’s boundaries. Leakage suppression weakens thin flowing of incorrect depth. This mode is useful when foreground and background have similar colors. Edge preserving mode uses the information about edges mostly from the depth map that helps to keep borders sharp even in case of blurred edges on the input video sequences. This mode is useful when the object boundaries are blurred in the source image. Fast general mode fits well for videos without complex edges and thin areas of different depth values. If the key frame contains high textured area with extra micro relief on a depth map, Microrelief suppression mode is the best solution for such a situation. YUVsoft Depth Propagation takes one or two previously generated frames and a source video as an input. You then receive a depth map video sequence as the output. 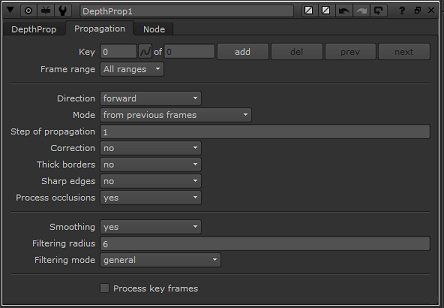 Depth Effects technology allows to automatically or semiautomatically obtain depth maps to use as depth key frames. Depth Propagation from a key frame created with Depth Effects. 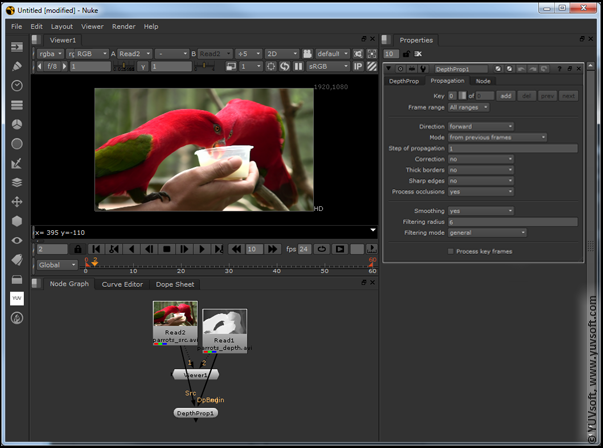 Depth from Focus technology – works well for scenes where foreground objects are blurred and where manual rotoscoping is an undesirably complex and expensive option.